War Memorials Trust works to protect and conserve war memorials in the UK. The charity provides free advice to anyone as well as running grant schemes to support repair and conservation projects. You can find a range of resources on this website to help you engage with our unique war memorial heritage. The Trust is a charity so if you support our work please consider making a donation. 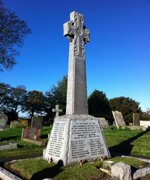 Get involved with War Memorials Online to upload photos, check location, contribute condition information and add links for your local war memorial. In Mem oriam 2014 is a partnership between War Memorials Trust and the SmartWater Foundation to protect memorials at risk of theft or damage by marking them with a forensic liquid called SmartWater. To apply for the product visit the In Memoriam 2014 website. The Showcase features grants to war memorial conservation projects across the UK. Search the showcase to find out more.